Join the Climate Impacts Group for a Program on Climate Change Event, “The Wild West of Online SciComm: a conversation with Heidi Roop and Daniel Swain” on Tuesday, April 16th at 3:30PM in OCN 425. Daniel Swain holds joint appointments as a Climate Scientist within UCLA’s Institute of the Environment and Sustainability, a Research Fellow in the Capacity Center for Climate and Weather Extremes at NCAR, and the California Climate Fellow at The Nature Conservancy. 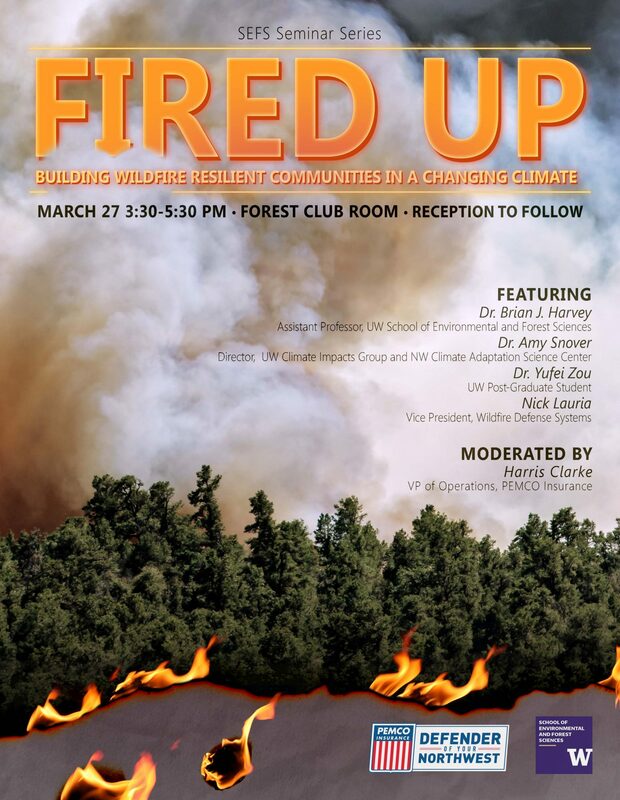 Dr. Amy Snover, Director of the Climate Impacts Group will serve as a panelist for the upcoming UW School of Environmental and Forest Sciences (SEFS) Seminar “Fired Up: Building Wildfire Resilient Communities in a Changing Climate” on March 27th, 2019. Amy will be joined by Dr. Brian Harvey from SEFS, Dr. Yufei Zou from the UW Pacific Wildland Fire Sciences Laboratory and Nick Lauria from Wildfire Defense Systems. The panel by will be moderated by PEMCO VP of Operations, Harris Clarke. Dr. Heidi Roop will give a keynote lecture at the San Juan Agricultural Summit on Sunday, February 3rd. Heidi’s keynote address, “From Coastlines to Crops: What Climate Change Means for the Puget Sound,” will highlight the range of climate impacts we expect in the Puget Sound region. She will share the range of climate impacts we expect in the region, and around the world, and discuss climate change communication best practices. Heidi will also host two community conversations on climate change in the Puget Sound. The first, open to the public, will be held prior the Summit Hoedown at Brickworks in Friday Harbor on Saturday, February 2nd. Join EarthLab and the Simpson Center for the Humanities for a screening of Chasing Ice, as part of the Anthropocene Film Salon series. CIG’s Heidi Roop and the Simpson Center’s Jesse Oak Tayler will be on hand after the film for a panel discussion. The goal of this event is to foster mutual learning and catalyze new, cross-cutting collaborations to address the unique social-ecological challenges of the Anthropocene. When: November 28th, 5:30 p.m. to 8:00 p.m.
Are you concerned about what climate change might mean for your tribe? The Climate Impacts Group, in partnership with the Northwest Climate Adaptation Science Center (NW CASC), hosted a webinar to introduce a new suite of Tribal Vulnerability Assessment Resources designed to support Northwest and Great Basin tribes’ efforts to assess climate risks to natural and cultural resources. A Tribal Climate Tool, which provides interactive maps, graphs and reports summarizing projected changes in climate for the unique geographies and impacts of concern to Northwest and Great Basin tribes. The Puget Sound Climate Preparedness Collaborative, Tulalip Tribes, University of Washington Climate Impacts Group and the Northwest Climate Adaptation Science Center are hosting a workshop, Managing Western Washington Wildfire Risk in a Changing Climate, on December 3rd, 2018, in Tulalip, WA. Recent smoke events in western Washington, driven by large wildfires across the Northwest, British Columbia and California, have raised concerns among western Washington communities about climate change and the impacts of more wildfire in the region. How will climate change affect the potential for wildfire west of the Cascades and what can western Washington communities do to address that risk? CIG’s Heidi Roop was invited to give a lightning talk at this year’s Seattle Aquarium Lightning Talk event on November 15th, 2018. Heidi will join 8 other speakers who will offer “five-minute glimpses into the latest marine and ocean science from local scientists and science enthusiasts.” This event will include light hors d’oeuvres, dessert and a reception in the Life on the Edge exhibit with the presenters. We hope you’ll join us! CIG researcher, Heidi Roop, has teamed up with local artist, Anna McKee, and UW glaciologist, Peter Neff, to create an art installation about the regional impacts of sea level rise for the 2018 Surge exhibition at the Museum of Northwest Art. The installation, called Evidence Wall, is a series of “maps” that explores the unique relationship between ice sheet decline in West Antarctica and rising sea levels in the Pacific Northwest. CIG researcher, Guillaume Mauger, also served as an advisor to artists participating in this year’s Surge exhibit, through his participation in a art-science residency at PLAYA in July, 2018. Join CIG’s Guillaume Mauger and the Washington Silver Jackets on Wednesday, September 19th at 10 AM for a webinar on Climate Resilience in Flood Risk Management: Culvert Replacement. Washington state is currently mandated to replace thousands of culverts that create barriers to fish passage, resulting in a substantial reduction in available habitat. Given the scale of this investment, WA Department of Fish and Wildlife and UW Climate Impacts Group have begun to assess the potential impacts of climate change on culvert design. George Wilhere, a senior research scientist in the habitat program at WDFW, and Guillaume Mauger, a research scientist in climate science at CIG, will review recent research, describe two new online tools, and discuss potential applications.